“How did you make that?” is the question often posed to jewelry artisan Lisa Sheryle Phipps upon encountering her displays at art shows. She’d love, instead, for people to ask why she made them. As a psychology major in college with a keen interest in human nature, Lisa has an answer that also explains why individuals, drawn to her handmade creations, feel compelled to touch them. Based on her observations, she concludes, “It’s an innate response.” Humans need to connect with nature. 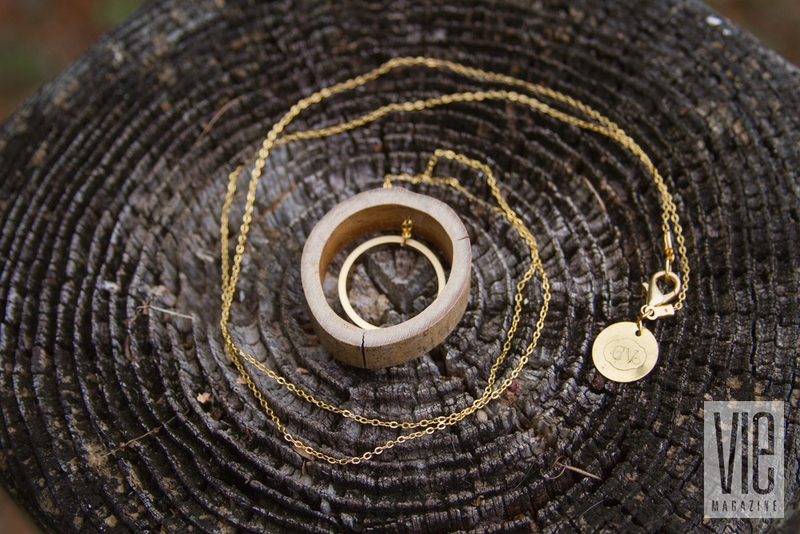 Launched three years ago by Lisa and her husband, Gavin Phipps, to engage the senses and revive that connection, Chic Verte (namely, “Fashionably Green”) presents moderately priced jewelry and accessories for everyday wear and pleasure. 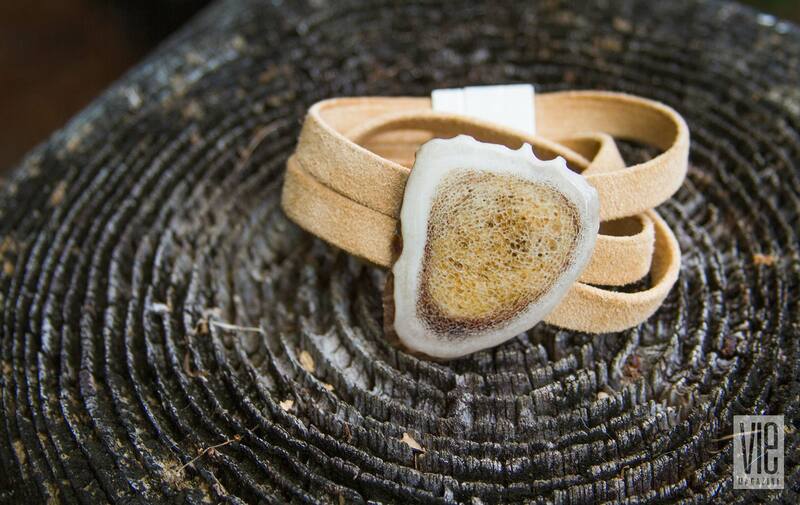 Responsibly sourced animal, plant, and mineral components, as well as man-made relics associated with outdoor pursuits, distinguish Lisa’s one-of-a-kind pieces. Keeping many of her supplies in a large vintage card catalog cabinet from the University of Texas’s law library, Lisa gathers the majority of her raw materials from family-owned properties—Ayavalla Plantation in Northwest Florida, Heirmosa Ranch in Northern Montana, and a vacation home in Cape Cod. 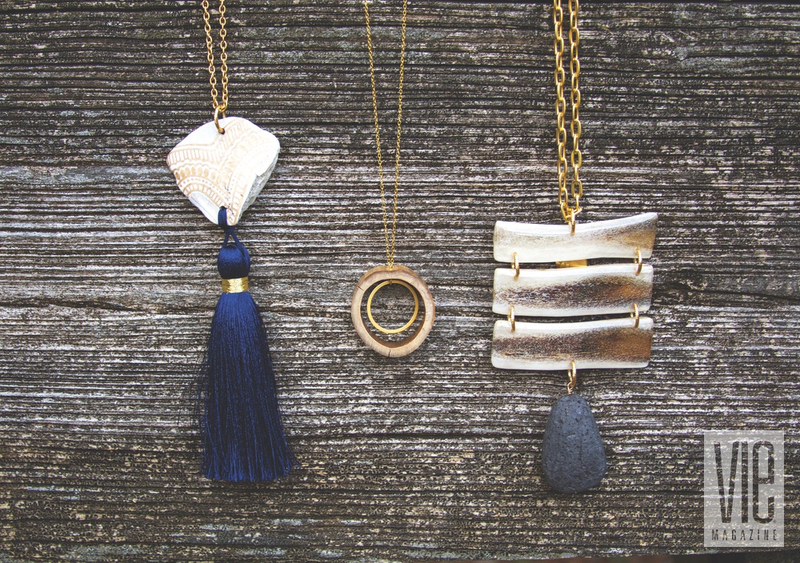 “My pieces use materials that are overlooked,” Lisa notes. Aware of her mission, friends help, alerting her when they have a tree that has fallen in a storm, or when they’re ready to dispose of old riding gear. “Now people, usually hunters, will bring me feathers,” Lisa says. Some also give her special articles, such a beloved horse’s hair, for custom work. Always personally inspired, Lisa has designed collections to reflect the character and values of each region. Borrowing from the Plantation, Ranch, and Shore Collections, the Bohemian Collection’s aesthetic is a little more rugged and carefree. “We knot the leather,” Lisa points out, “to form a macramé-style base.” The Tally Collection makes another statement—as in “Go Seminoles!”—with an array of garnet and gold, the colors of Florida State University in Tallahassee. The Petite Verte Collection appeals to younger customers by injecting pops of color and Swarovski crystals. 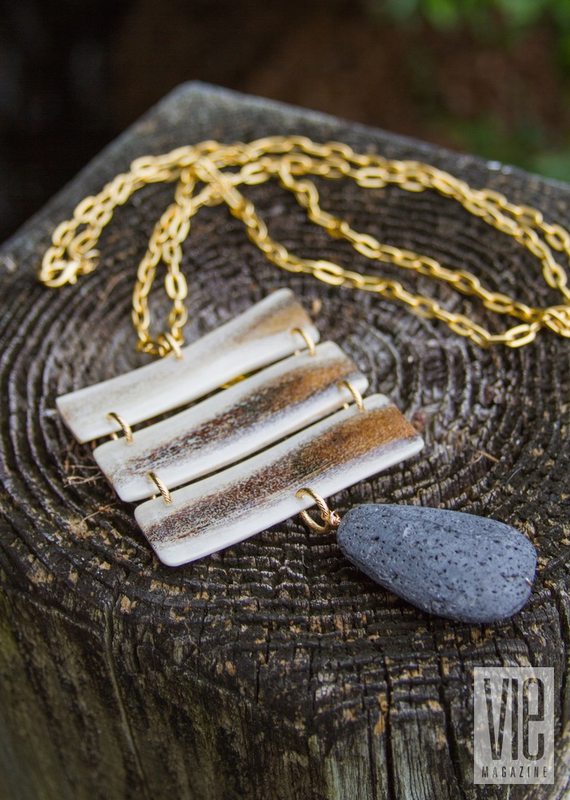 With any creation, Lisa aspires to showcase the beauty and significance of nature. Sharing Lisa’s passion for conservation, Gavin upholds a family legacy of land ownership and accountability that dates to his great-great-grandfather, Henry W. Phipps, Jr.—business partner of Andrew Carnegie (founder of U.S. Steel). Henry invested heavily in real estate. Over time, Gavin’s great-grandfather and grandfather also acquired land, including thousands of acres in Northwest Florida, home to Ayavalla Plantation, headquarters for Chic Verte. Dedicated to preservation and responsible land management, Gavin and his father remain involved with various conservation causes, including Florida-based Tall Timbers Research Station and Land Conservancy, which conducts research and provides education to promote “exemplary” land stewardship. Their respective ancestors also passed along artistic traits that explain Lisa and Gavin’s affinity for jewelry design. In fact, Gavin’s great-grandmother, Elizabeth Klapp, received honors at the Paris Exposition of 1900 and the Pan-American Exposition of 1901 for her avant-garde jewelry creations. Lisa, in comparison, says, “All of the women in my family had busy hands. My great-grandmothers and grandma were constantly knitting, and my mom loved needlepoint and all kinds of other media.” Neither Lisa nor Gavin, however, planned on the jewelry business. Married twenty years, Lisa says, “Gavin and I were college sweethearts.” Lisa intended to earn her master’s degree in psychology, but after graduating from Rollins College in Florida and marrying, the couple moved to London, where Gavin trained as a chef at Le Cordon Bleu. Returning to Florida, he put his culinary skills to work at the Ocean Reef Club in Key Largo. Lisa managed the local Golden Basket jewelry store, known for its miniature Nantucket lightship baskets in gold and silver. A kitchen fire put Gavin’s job on hold, so he joined Lisa in the store. “We loved the dynamics of working together,” she says. On occasion, they’d sketch alternative designs for customers who wanted something a bit different, prompting them to launch their own operation, Phipps Jewelry Company in Tallahassee, with signature collections (quail, Labrador retrievers, acorns, and couture) and custom offerings. They have a New York jewelry fabricator on hand for Phipps, but Lisa and Gavin craft all of Chic Verte’s collections on location in the studio along with some assistants who assemble the pieces. “Gavin is my CCO, or chief chainsaw operator,” jokes Lisa, who buffs and shapes smaller pieces. A jewelry professional accredited by the Gemological Institute of America, Lisa says her hands-on skills are self-taught, often by trial and error. Fresh ideas frequently pop into Lisa’s head, such as branching into housewares. “We currently have wood coaster sets that when put together make a butterfly,” she says. 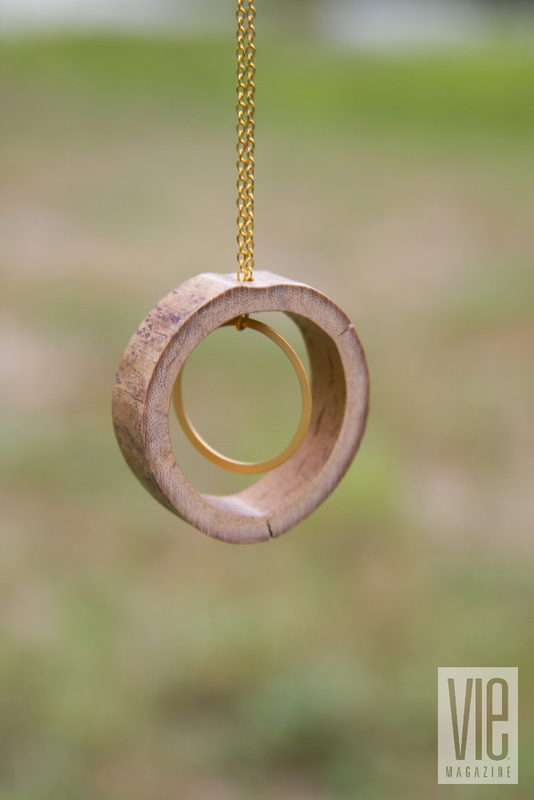 “I would love to learn to turn wood and make some giant salad bowls, maybe with antler handles or a base.” Merging aspects of Chic Verte and Phipps Jewelry to broaden their customers’ options is also on the drawing board—always with why in mind. Visit www.ChicVerte.com to see more from each collection, find retailers, shop via Etsy, and contact Lisa. Details about Phipps Jewelry Company are available at www.PhippsJewelry.com.